So, this is the cool attraction I worked on back when I was in California. 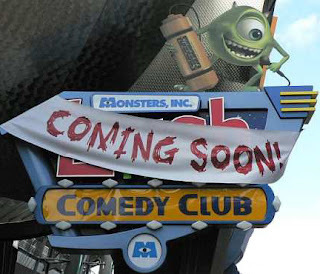 It's The Laugh Floor Comedy Club, starring Mike Wazowski and company. Mike is always coming up with the next big idea at Monster's Inc, and this is no exception. He figures it makes more sense to harvest laughter from crowds rather than get it from one person at a time. I think he's on to something. You can find out how his concept tests in the Magic Kingdom at Disney World, while Roz grades the results. I was able to work closely with Mike along with some of his close friends that perform as comedians, who will attempt to tickle your funny bone. If you happen to pay them a visit, tell them Tonymation sent ya!